We've made it to the last Command Post on Memory Lane! 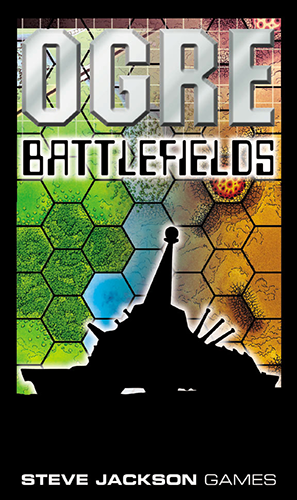 To complete our Ogre 40th Anniversary retrospective, we come to Battlefields. This was the final Ogre/G.E.V. supplement, following Shockwave and Ogre Reinforcement Pack, released in 2001. Whereas Ogre Reinforcement Pack added many more units to our forces, facilitating the massive battles that played in our mind's eye, Battlefields gave us the means to expand those conflicts across more terrain with four new maps! And these weren't just any maps! They were designed to seamlessly fit in and/or replace the previous G.E.V. or Shockwave maps - each of the two sets were geomorphically identical to the original pair of maps. Establishing the naming convention that carries on to this day, maps G-2 and G-3 plus S-2 and S-3 opened new vistas for scenarios. Any G-map could be aligned next to any S-map, and the roads, rails, and waterways would all continue uninterrupted. But even though the edges of the maps matched, the terrain was markedly different on the four maps. Complex rail and road networks, waterways and lakes, and even dense forest and large swathes of swamp all featured on one or more of the maps. Some maps favored GEVs; others Heavy Tanks and Superheavies. One even seemed tailor-made for infantry! All four breathed life into the old scenarios. Battlefields was more than maps, however. Rules for both Militia and Engineers (with corresponding counters!) were included. Militia have not made the leap to Ogre Designer's Edition and Ogre Sixth Edition (yet! ), but the rules for Combat Engineers and their associated tasks served as the starting point for the new rules governing these units in the current edition. Finally, there were scenarios, both new and revamped. Guidelines were provided to create scores of different "Ceasefire Collapse" scenarios. New versions of "Breakthrough" (G-2 and S-2) and "Raid" (G-3 and S-3) were detailed, to each use a pair of the new maps. There were four new scenarios as well, one for each map: "The Last Train Out" (G-2), "Same Song, Second Verse" (G-3), "Disputed Crossing" (S-2), and "A Bridge Too Near" (S-3) highlighted some of the special features of the new maps. Battlefields was arguably the hardest Ogre/G.E.V. supplement to find – until now. As with Ogre Reinforcement Pack, some of the rules have been updated in the current editions, but this does not detract from the overall value. Owners of Ogre Designer's Edition already have maps G-1, G-2, S-1 and S-2, and Ogre Sixth Edition owners can acquire these maps in the Ogre Giant Battlefield Set, available on W23. This digital rendition of Battlefields is the only way to acquire maps G-3 and S-3 . . . for now. Who knows what else the Ogre 40th Anniversary celebration has in store!